The perfect accessory for your distribution amp (Ideal companion to our DA16 or DAS15 video distribution amps). After duplicating your videos, the VS1600 lets you check copy quality quickly and easily. Just play back all your videos at once, and route them through the VS1600 dub checker. Then simply punch the selector push buttons in rapid succession to view and hear the video playback from each recorder one right after the other. It only takes a few seconds. You won't have to remove each video one by one and shove it into the one machine that's connected to your monitor, and rewind and play back each video, one at a time. Catch clogged heads and other duplication problems with an absolute minimum of time and effort, and be glad you did. 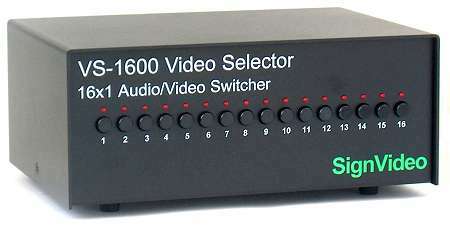 Just hook up the outputs from as many as 16 VCRs or DVD recorders to the inputs of the VS1600 Video selector. Then hook up the output of the VS1600 to your video monitor. When you're finished duplicating videos, rewind all the tapes a little to the ending scene of the tape, then stop and play back all the copies at the same time. You can do this by using one remote control to put all the duplicating decks into rewind, then stop (or to random access DVDs). Then use the remote to play all the videos back at the same time. During play back punch the VS1600 push buttons one after another, feeding the output of each recorder one after the other into your video monitor. This allows you to sample playback quality of all the tapes in rapid succession. When you want to go to the next check point in the tape, just rewind all the decks again, and repeat the process. We recommend that you do this quality check at least once at the end, middle, and beginning of each video. It's all a whole lot easier and faster than moving tapes around, and rewinding and checking them one at a time. Select any of sixteen inputs to feed a single destination. Example: Select from several video or DVD players or cameras to feed a single monitor. Take advantage of our 30 day unconditional money back guarantee. Distribution amp, dub checker, video selector are generic descriptions. 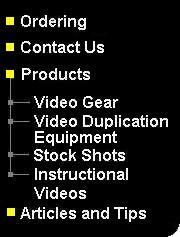 VS1600 and SignVideo are trademarks of Sign Video Ltd.